A common refrain from climate action naysayers is that, “China is building two coal-fired power plants a week!” They insist that the United States should wait until this major emitter takes on binding commitments to climate change mitigation before it decides to adopt global warming pollution reduction policies in the American Climate and Energy Security Act (H.R. 2454). They further claim that if such a bill became law, the United States would be transferring its jobs to countries such as China and India that are doing nothing to curb emissions. But that thinking is exactly wrong. Critics fairly point to the fact that 80 percent of China’s power is derived from dirty coal, and that China recently surpassed the United States as the word’s largest emitter of carbon dioxide. Yet China’s per capita emissions remain a fifth that of the United States, and its historical cumulative per capita emissions from 1960 to 2005 are less than one-tenth that of the United States. Still, the Chinese have recognized that it’s climate inaction—not climate legislation—that will lead to its own economic undoing. As the U.S. Congress debates the merits of enacting renewable electricity and energy efficiency standards, China has already forged ahead with building its own low-carbon economy, laying the foundation for clean-energy jobs and innovation. China ranked second in the world in 2007 in terms of the absolute dollar amount invested in renewable energy, according to the Climate Group. It spent $12 billion, which put it just behind Germany’s $14 billion. These investments have placed China among the world leaders in solar, wind, electric vehicle, rail, and grid technologies. And now approximately 9 percent of China’s $586 billion economic stimulus package will go toward sustainable development (excluding rail and grid) projects. China is expected to unveil in the coming weeks another extensive and unprecedented stimulus package—reported to be in the range of $440 billion to $660 billion—dedicated solely to new energy development over the next decade, including generous investments in wind, solar, and hydropower. If those expectations are fulfilled, China could emerge as the unquestioned global leader in clean-energy production, significantly increasing its chances to wean its energy appetite off coal, and at the same time ushering in an era of sustainable economic growth by exporting these clean-energy technologies to the world. The bottom line: China is not there yet, but it is beginning to transition to a clean-energy economy through a wide range of actions. The United States should recognize China’s efforts and encourage China to expand upon them. We have sketched this claim before, but let’s run though the numbers in more detail. Energy efficiency is China’s primary energy priority. China just last year revised its Energy Conservation Law to declare that it “implements an energy strategy of promoting conservation and development concurrently while giving top priority to conservation” (emphasis added). This emphasis runs through many of China’s policies. China aims to reduce energy intensity—the amount of energy consumed per unit of gross domestic product—by 20 percent of 2005 levels by 2020. Each province and provincial-level city has been assigned an energy intensity reduction target ranging between 12 percent and 30 percent, and the respective governors or mayors are held accountable to such targets. Their success is part of the basis for their evaluation for promotion. China has made steady progress toward reaching this goal, achieving a 10-percent reduction of energy intensity by the end of 2008. If the goal is fully realized, it will translate to an annual reduction from a business-as-usual scenario of over 1 billion tons of carbon dioxide per year starting in 2010. By comparison, the European Union’s targets under the Kyoto Protocol translate to an annual absolute reduction of 300 million tons of carbon dioxide by the end of its compliance period in 2012. The Top 1,000 Energy-Consuming Enterprises program, which China started in 2006, sets energy efficiency benchmarks for the top 1,000 energy-consuming enterprises across nine sectors of heavy industry. These 1,000 industries alone constituted 33 percent of China’s overall energy consumption and 47 percent of industrial energy consumption in 2004, and 43 percent of China’s carbon dioxide emissions in 2006. Data suggests that the program is on target to achieve its goal of saving 100 million tons of coal equivalent, which translates to reducing carbon dioxide emissions by between 300 million and 450 million tons. This is also the equivalent of removing 68 million to 100 million cars from the road. China launched a rebate program in April 2008 to subsidize the purchase of energy efficient light bulbs by 30 percent on wholesale purchases and 50 percent on retail sales. Some local governments provide an additional subsidy of up to 40 percent. China subsidized 62 million bulbs by the end of January 2009, which can help save 3.2 billion kilowatt hours of electricity annually and reduce carbon dioxide discharges by 3.2 million tons. China announced plans earlier this year to double the size of the program to subsidize 100 million bulbs in 2009. Smaller and less efficient power plants in China are closing down as larger, more efficient power plants are built. China shut down 34 gigawatts worth of small, inefficient plants between 2006 and 2008, and plans to close another 31 GW over the next three years. This active policy of “opening-the-large-and-closing-the-small” increased average efficiencies from 370 grams of coal per kilowatt hour of electricity generated in 2005 to 349 grams in 2008. And new plants such as the 1 GW ultrasupercritical coal plant in Yuhuan can generate a kilowatt hour of electricity with just 283 grams of coal. China enacted a new building code in 2006 that requires new buildings to halve their energy consumption levels compared to the current average. Enforcement remains a difficult challenge, and the code does not address the vast stock of existing structures, only 4 percent of which meets the new standards. A more successful program has been the requirement that government offices set thermostats at no lower than 26 degrees Celsius in the summer and no higher than 20 degrees Celsius in the winter, while encouraging the general public to do the same. And China has recently launched the Three Star green building evaluation standard, a voluntary set of standards aimed at encouraging green building development with performance standards above and beyond what the building code requires. China is the world’s largest producer of electronic and home appliances, and it developed mandatory energy efficiency standards and labels for a range of such products in 2005. These standards are coupled with the adoption of green procurement polices for government offices and state-owned enterprises and will enable China to avoid 100 million tons of carbon dioxide emissions per year. A pilot energy demand-side program—whereby the quantity and pattern of consumption are smartly managed to match supply constraints—in Jiangsu province has eliminated the need to build 300 megawatts of electricity capacity in the area, thus eliminating 1.84 million tons of carbon dioxide equivalent. A World Bank study concludes that if properly scaled, demand-side management can eliminate the need to build more than 100 GW of electricity capacity in China by 2020. China is keenly aware of the threats that climate change poses and the need to diversify its energy base away from coal and oil. The Renewable Energy Law of 2006 and subsequent Medium and Long-Term Renewable Energy Plan set a framework for ambitious targets to develop renewable energy sources in China. China has set a goal of generating 10 percent of its primary energy from renewable energy sources by 2010, and 15 percent by 2020. China just tripled is 2020 target for installed wind capacity from 20 GW to 100 GW and has recently surpassed India as the fourth-largest installer of wind power. China’s 2020 target of building 1.8 GW of installed solar power capacity is expected to be increased at least fivefold to 10 GW. China was the world’s largest manufacturer of solar photovoltaic panels until recently, providing roughly 40 percent of the global market share in 2008. An overwhelming majority of those solar panels have been exported, but China’s domestic solar market is on the cusp of experiencing a boom thanks to new solar incentives announced this year that cut the cost of purchase and installation by as much as half. One in 10 Chinese households use solar thermal water heaters. China had deployed 40 million solar water heaters in 2007—two-thirds of the global market share. The country plans for 30 percent of its households to have installed solar water heaters by 2020. China has a target for 300 GW of installed hydropower by 2020, which is twice what it has now. China implemented a feed-in tariff for biomass power generation at the rate of 3.2 cents per kwh. This means that China essentially provides a preferential electricity tariff to biomass power producers of 3.2 cents per kwh over the tariff for conventional fossil fuels. It plans to install 30 GW of biomass power capacity by 2020. China aims to use 10 million tons of bioethanol and 2 million tons of biodiesel by 2020, replacing 10 million tons of petroleum-based fuel annually. The national renewable energy targets do not include nuclear energy. China currently has just over 9 GW of installed nuclear power, but is poised to ramp that up to account for 5 percent of electricity production by 2020, translating to an installed capacity of 60 to 75 GW. All electricity end-users (other than the agriculture sector and residents of Tibet) have had to pay a renewable energy surcharge of 0.001 yuan per kwh since 2006. This surcharge doubled to 0.002 yuan per kwh for commercial and industrial users in August 2008. Proceeds from the surcharge have been distributed in three batches to renewable energy projects (mostly wind and biomass)—$34.6 million in 2006, $106 million in the first through third quarter of 2007, and $295.2 million in the fourth quarter of 2007 through the second quarter of 2008. China, like the United States, must modernize its national grid infrastructure in order to accelerate its uptake of renewable energy. This discussion is actively in the works now. China is an emerging world leader in ultra-high-voltage, or UHV transmission technology, with more than 100 domestic manufacturers and suppliers participating in the manufacturing and supply of UHV equipment. A transmission line from Shanxi to Hubei boasts the highest capacity in the world, and is able to transmit 1,000 kilovolts over 640 kilometers. The State Grid Corporation will invest $44 billion through 2012, and $88 billion through 2020 in building UHV transmission lines. China will unveil in the coming months plans to build an extensive smart grid by 2020. In contrast to the decline of the United State’s automotive industry, China is creating a strong and robust automotive manufacturing capacity, especially with respect to highly efficient cars, hybrid-electric vehicles, and pure-electric vehicles. China has fuel economy standards that translate to 36.7 miles per gallon and is said to be considering a proposal to raise that to 42.2 mpg by 2015. The U.S. standard was only 27.5 MPG for 20 years, although President Barack Obama announced a new standard in May of 35.5 mpg by 2016. China last September doubled taxes on cars with engines above four liters from 20 percent to 40 percent, and increased them from 15 percent to 20 percent for those with engines between three and four liters. At the same time, China reduced taxes for cars with engines under one liter from 3 percent to 1 percent. China has been criticized until recently for fixing energy prices at artificially low rates. China is now embarking on progressive energy price reform to indirectly link transportation fuel prices to global crude prices. It raised gasoline and diesel prices once in 2007 and once in 2008. Yet it has increased prices twice in the first five months of this year alone. China wants to raise its annual production capacity of hybrid, all-electric cars and buses to 500,000 by the end of 2011. This would account for only 5 percent of total car sales, but is up from 2,100 in 2008. Thirteen cities will roll out pilot subsidy schemes for “new energy vehicles,” ranging from $7,350 for small hybrid passenger cars to $87,700 for large, fuel-cell-powered commercial buses. The subsidies will target public-sector purchases such as public transportation, sanitation, and postal services. The State Grid plans to deploy pilot networks of charging stations in Beijing, Tianjin, and Shanghai, while Nissan-Renault plans to help establish a pilot charging infrastructure network in Wuhan. China’s emerging leadership in electric vehicles is based on its innovation in energy storage technology. The world’s first mass-produced, plug-in hybrid is the F3DM, launched by China’s BYD Auto last December. Just six years ago this company was only in the business of making batteries for mobile phones. The F3DM sells in China for approximately $22,000. China has also become the world’s leader in electric bicycles, which are fitted with a small 250-watt motor and rechargeable nickel-cadmium battery. They have a range of 60 kilometers between charges and can reach speeds of 30 kilometers/hour, which make them ideal for intracity mobility, providing a zero-emission (during operation) alternative to a car or motorcycle. China accounts for 80 percent of global electric bicycles sales. Cars will probably remain outside of economic reach for Chinese households, despite the growing automotive market. Mass transit—particularly intracity subways and long-distance high speed rail—will remain the mobility solutions of choice. China is embarking on the largest railway expansion in history and plans to spend almost $300 billion expanding its railway network from 78,000 km today to 120,000 km in 2020. Of this, 13,000 km will be comprised of high-speed rail. The 1,300 kilometer Beijing-Shanghai line is under construction and it will reduce travel time between those destinations from 14 hours to 5 hours when it opens in 2013. This will attract an estimated 220,000 daily passengers and should dramatically reduce air travel between the metropolises. China reportedly has 26,000 km of electrified railways, making it second in the world in this arena. Encouragingly, this figure accounts for 32 percent of China’s total railways, but is responsible for 50 percent of overall passenger and cargo volume. China is poised to have the world’s largest network for intracity urban rail transit. About 2,100 km of railway lines will be laid and operational by 2015 in 19 cities. Ten cities currently have 29 urban rail routes, totaling 778 km, and 14 cities are building 46 urban rail lines, which total 1,212 km. An unprecedented wave of rural-to-urban migration is creating opportunities to experiment with new development patterns. There are over 40 different eco-city projects currently proposed or under development throughout China. Low-carbon manufacturing zones, such as those in Baoding, Tianjin, and Jiangsu, are emerging as engines of growth for clean energy. China has a target to increase forest area coverage to 20 percent by 2010 and has committed $9 billion annually toward this effort. A total of 1,200 counties across the country are utilizing fertilizers according to the results of local soil tests to reduce emissions of nitrogen oxide—a less common but more potent global warming pollutant. 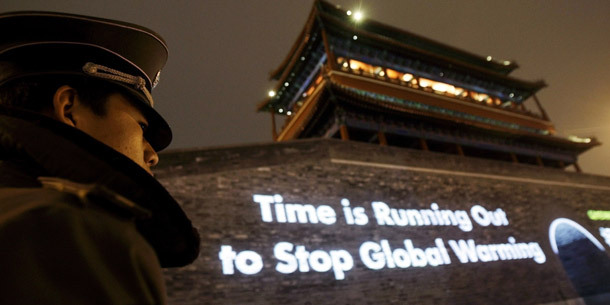 It’s true that China’s absolute emissions are rising as its economy continues to expand by 6 percent to 8 percent annually even amidst a global recession, and that compliance with government mandates are difficult to assess given the lack of transparency in reporting or to enforce due to limited institutional capacity. But it would clearly be incorrect to accuse China of doing nothing on climate change. When the framework for assessing a country’s climate change mitigation efforts is narrowly confined to carbon emission caps, it glosses over a multitude of complementary actions that provide meaningful emissions reductions compared to a business-as-usual scenario. This is why we at the Center for American Progress have proposed “carbon cap equivalents” as a better model for assessing a country’s carbon profile rather than only looking at stipulated caps. The carbon cap equivalents strategy calls for us to rigorously model what China’s carbon dioxide emissions reductions will add up to through a future date—such as the 2020 benchmark midterm year used in the U.N. climate change negotiations process—relative to a base line year, such as 1990. Looking at the full range of China’s measures in this way shows that these iterated measures will amount to significant reductions relative to a business-as-usual scenario had China continued its emissions growth unabated. Together they will amount to a level of emissions reductions equivalent to if China had adopted an explicit targeted emissions cap. We must also use the same technique to reveal the actual carbon emissions reductions achievable in the midterm by the American Clean Energy and Security Act currently making its way through Congress. A full analysis of the carbon cap equivalent of ACES compared to a model of the full range of measures being undertaken by China will likely show that the two countries are not as far apart in terms of their aspirations for carbon reductions as is commonly thought. What makes the above list of actions by China all the more impressive is that the country’s leaders decided to act unilaterally even though its per capita GDP and per capita emissions, both historical and present, remain a fraction of the United States’. China hasn’t done so out of charity, but out of recognition that doing so is both critical to its national security and a huge opportunity for future economic prosperity. Sure, China can do more. But we can create a much more constructive platform for forging a consensus in Copenhagen or forming the basis for a bilateral agreement with China on climate change by acknowledging and understanding the effects of the full range of China’s climate actions outside of its lack of hard caps on carbon emissions. A more extensive analysis should quiet the naysayers on Capitol Hill that use the false excuse of Chinese inaction to block the passage of the historic climate and energy bill in the U.S. Congress. Julian Wong is a Senior Policy Analyst and Andrew Light is a Senior Fellow at the Center for American Progress.